The popular Summit Complex is located on Thomas Drive. This condo looks out over the gorgeous white sand beaches of the beautiful gulf of Mexico. 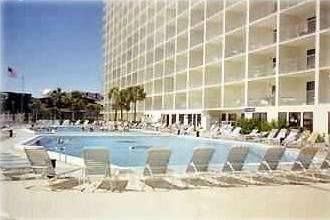 Has plenty of room, a great view and is convenient to restaurants, clubs, water parks, and everything Panama City Beach has to offer. You can enjoy a daquiri at the tiki bar right on the pool deck or play with the children in the kiddie pool or playground. There is a store on the property in case you forget your sunscreen! Enjoy all this and much more right outside your door. Also a restaurant serving fried shrimp to chicken wings and great burgers! There is plenty to do to keep the whole family busy! BRING YOUR OWN TOILETRIES, SHAMPOO, SOAP, Xtra TOILET PAPER ETC. This place is so great especially for the price. The view is great and it is on the second floor so you never have to use an elevator which was a huge plus. The place also has a great pool area with a bar. Would stay again! This was a great getaway vacation spot for me and my friends. We came down on spring break and were very happy with our decision to rent from Sonny and Angel. The owners of the property were very kind and supplied the room with a ton of good stuff that helped make our stay wonderful. The Summit is in a great location as it is the prime spot for spring breakers on the beach, and also is next to the main club that everyone goes to. I highly recommend booking with Sonny and Angel. THIS REVIEW IS JUST A LIE!! HIS BROTHER WAS HERE AND HE WANTED TO STAY WITH HIM AND COULDNT GET A REFUND FOR HIS 3 NITES. I had someone stay right after him and they loved the condo so much they booked for 4 months next winter. U can check my calendar..it's booked up. Had a wonderful time. Weather was absolutely georgeous. The condo was comfortable. Large deck and full kitchen. Spent most our our outdoors at the beach and on the deck. Very nice place. Great location! We had a wonderful time on our stay. Owner was very helpful with any questions we had. Spacious. 2nd floor located right next to staircase for easy walk to beach and parking lot. There were just 2 of us but you could easily sleep 8 comfortably. We plan on returning! We enjoyed our stay at this condo. The condo was very clean and the view is amazing. We were close to everything: restaurants, stores, and I loved that I did not need to take the elevator to go from the beach to the room. We will come back here next year. It was one of the best vacations we had so far. Thank you Angel for everything. Rates are subject to change until reservation is confirmed. Prices listed are for up to 6 adults plus kids. There will be 10.00 per day per person added for each adult beyond the 6.